of the Elegant chain. We then had some time to settle in our hotel and get ready for a treat. 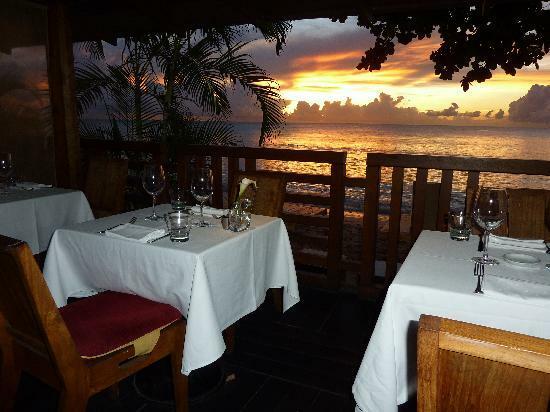 We were lucky enough to have supper at one of the best known restaurants in Barbados called Daphne’s – everything about Daphne’s was tremendous. Then it was off to bed to finally get a goodnight sleep for our Safari Adventure! Our breakfast buffet (included) at Tamarind was a great way to start our day; we were up early to head off on an Island Safari – which to this point – has been by far the highlight of my trip! We were loaded on the back of Range Rovers and our tour guide was very knowledgeable about the island and very funny. He drove us all over the island and would stop on the top of cliffs, so we could get amazing pictures of the scenery. We also stopped at a local beach area so that we could look at what the vendors were selling and have a refreshing drink of coconut water after our journey. We had a great buffet lunch at one of the properties they own, we watched them setting up for a wedding during lunch. Well, it looks like I just found where I want to get married. It is beautiful here! After our long great 5.5 hour tour, it is time to hang out by the pool before getting ready for our “Welcome Supper” at the Hilton, by the way for all you Bachelor fans – this is where it was filmed! So of course I decided to stay at the resort and burn like crazy! 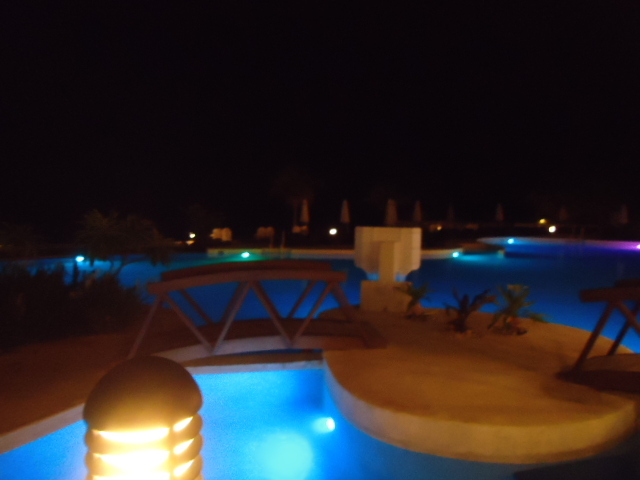 This evening we were guests at the Secrets Wild Orchid Hotel, oh my this place is absolutely gorgeous. Out of the resorts that I have toured and stayed in Secrets is by far a superior resort. The view from the resort in the evening is breath taking as you look across the water you see the city of Montego Bay. The beach is very nice, not very wide but the furnishings that they are using make it gorgeous. 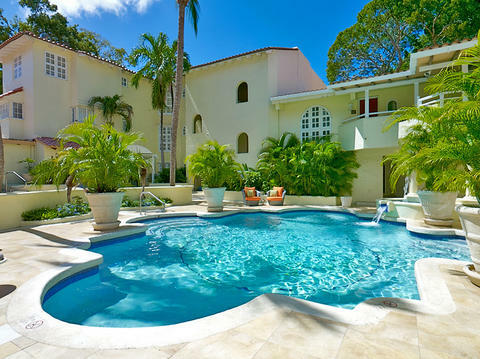 This property also has Secrets St. James but I would recommend the Wild Orchid as it is close to all the restaurants, bars and shopping. The standard rooms will blow your mind and you can upgrade to the master suite and then I must say WOW!!!! 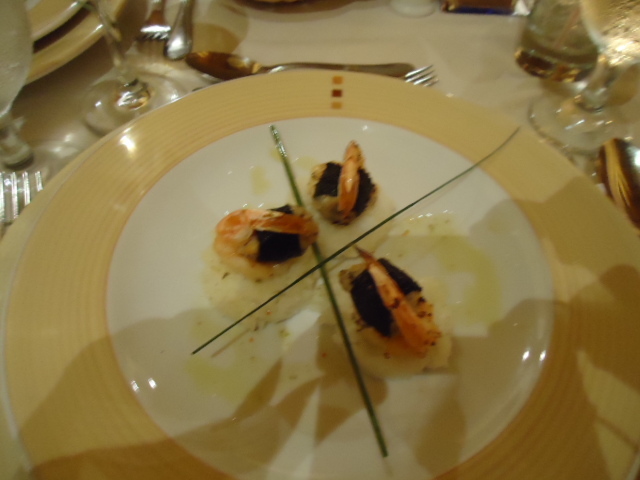 They served us appies and dinner at the Oceana Grille were the food and service was just as amazing as the resort. 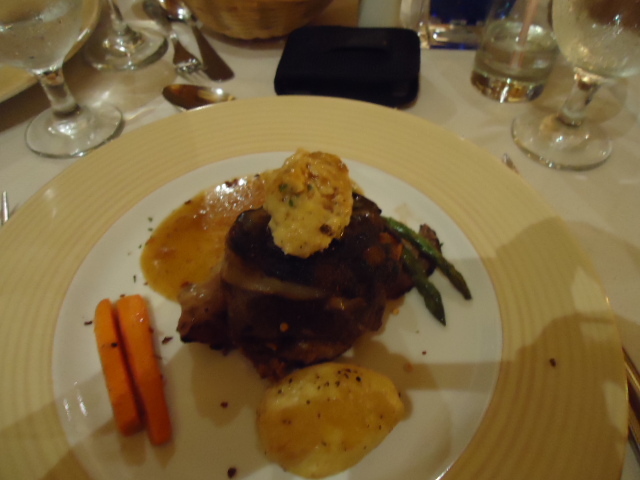 My steak was the best meal I have eaten in Jamaica! Yum, yes I did even try it! 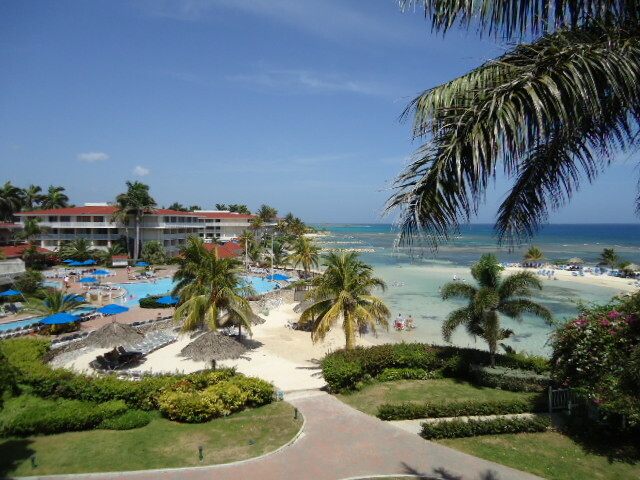 We checked out of the Holiday Inn Sunspree and headed out to the Grand Palladium Lady Hamilton for the day. They had arranged for us to use the facilities of the resort for the day as well had planned beach games and lunch. When we arrived at the Palladium we were met by their management staff and shown to our rooms to change, they had given our group 5 courtesy rooms and they are very beautiful. Everything was very organized and we all felt very welcomed. The resort is large and there are some steep inclines which could be a problem if anyone has mobility issues but this is my only concern with the property. The staff was so friendly and very thing was very organized. Lunch was great and oh my the rolls that they served were just out of the oven and to die for. In all the resorts that we had visited I would say the service and our lunch would be pretty comparable to the Secrets property, our water glasses were never empty nor were our stomachs. We were then treated to a mini massage which I didn’t want to get off my chair. After our day at the Grand Palladium Lady Hamilton ended we were then off to check into the Gran Bahia Principe Royal Golden. The drive from the Palladium to the Bahia was about two hours and we arrived around 6:30pm. 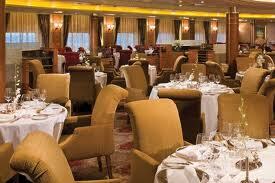 We checked into our Golden rooms then met for dinner at the Grill Restaurant. I have stayed at this property before so it was no problem finding my way around. Our dinner was good it just took along time. This was a long day so off to bed for me. Day at leisure and yes sun burn again! You would think that I would learn. I did put on sun screen but it really didn’t seem to do the job today, should have reapplied! Tonight we are off for dinner at the Iberostar Rose Hall Grand!!!! Another high end resort were the service and dinner were amazing. There was a storm blowing in so we were down on the beach watching the lighting before we had dinner. The Grand was very accommodating as they were aware that the hockey game was on so they put us in the restaurant right across from their theater and they had the game playing on their two big screens! Way to go Boston!!! So I started off with a flight on Air Canada Friday evening at 6:25pm and missed the hockey game as Air Canada does not show real time television. Made it to Toronto on time but it took about an hour and a half for the luggage, still not seen any hockey highlights. My overnight hotel was the Radisson hotel and Suites a short shuttle ride from the airport. To get on the shuttle you head down to P3 look for the hotel shuttle sign. I was asked for a voucher which I had never received but I did have my confirmation in hand so he let me get on. There was another agent from Uniglobe Geo waiting with her daughter as well so we all jumped on the shuttle and were finally going to see what happened in the hockey game. Arrived at the Radisson and checked in which was very painless. When I entered my room I did notice that it was getting a little tired looking but oh well, only here for one night. Then the hunt for the remote was on, checked every crook and cranny and could not find it. I could turn on the TV but I couldn’t turn the channels without the remote so still no hockey highlights. I decided to find them on my computer as WI Fi is included, when someone from the hotel did show up to bring me a remote they ended up just taking one from the room across the hall. 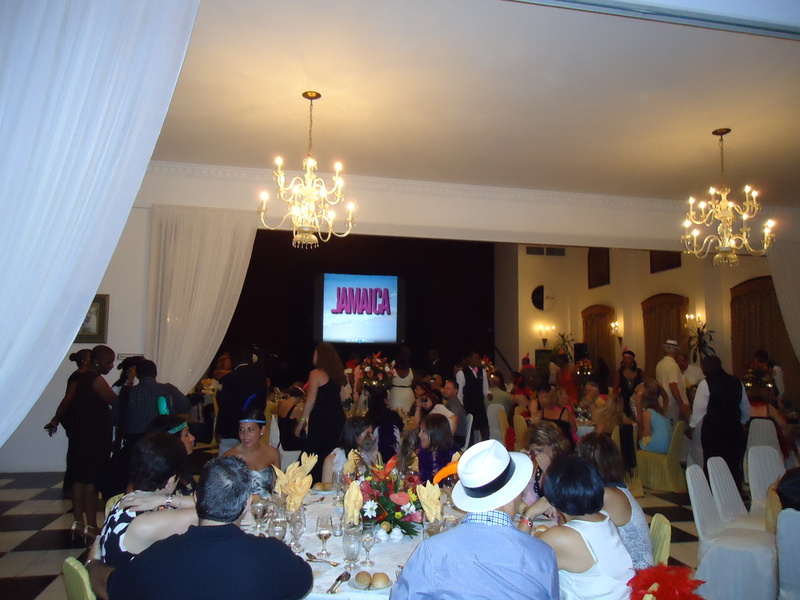 Our Transat flight departed Toronto for Jamaica at 12:45 and we arrived on time to Jamaica. The line at immigration was massive, we waited for about an hour to finally get through and then waited on the bus for another hour as some of the agents decided to take other transportation and didn’t let anyone know. We finally arrived at the Holiday Inn Sunspree, the property is exactly the same as it was two years ago when I was here. No surprises for me, can’t really say the same for some others. Check-in was quick, I am staying in building 1 on the 4th floor with a ocean pool view. In my opinion the Holiday Inn is a 3 or 3 ½ star property, the food is probably the biggest drawback and the furnishing in the buffet. The property does have its return clients, which is great, if you are looking for a budget property with a good location then yes you will do fine here. The transfer from the airport to the hotel is about 10 minutes so if you have children and you don’t want to travel across the island maybe think about this property. There seem to be a lot of younger adults here as well as young families. So our day starts at 9:00am and we are off to the Good Hope Plantation were we will be meeting up with the other groups who have been in Jamaica since Wednesday. We were told of the history of the great house and plantation and then taken on a tour. After that was complete they had planned a treasure hunt where 4 people from each team had to compete, the winners were from Sunquest. After we completed the morning with Good Hope we were then given over to Chukka Tours who have just opened a new location. The new location is close to the new cruise port of Falmouth, this is close enough that if you make the stop on your cruise you will be able to do one of the tours the Chukka has. This time with Chukka I did the river kayaking which was great as it was sooooo hot that it was nice to be on the water and get cooled off. If you do have a large group I would recommend calling ahead as they may not have enough equipment for everyone to do the ATV’s or Dune buggies. Finally around 4:30pm we are on our way back to the hotel, it has been a very hot and tiring day with a lot of waiting around and not that much shade. We did have a few people that didn’t handle the heat very well and were pretty sick on the bus ride back to our hotel. We are now off to the Half Moon resort for our Gala evening, OMG this place is gorgeous. They really know how to make you feel special and welcome. The appies and drinks were very tasty, one of my favourites was bacon wrapped banana, yum. Dinner was served in the convention centre were they served us: cream of pumpkin soup, coconut snapper and an angle cake for dessert. The soup and desert were great, I am not a fish eater so my problem. We finished up at Half Moon and headed back to the Holiday Inn which is a 2 minute bus ride. My first stop was the beach bar for a cheese burger, I must say the cheese burgers at the beach bar are very tasty. A few of us decided that we needed to go for a dip around midnight, I decided about 1:30am that it was time to turn in. Gala Awards Night. Selected agents and agencies were awarded a Certificate of Excellence for their outstanding sales performance. Well we finally made it to Adelaide. We took The Great Ocean Road which was totally amazing. The scenery is absolutely beautiful. The road was very curvy, and i survived. I took gravel and then at the first coffee stop i ran into the pharmacy and bought an Australia motion sickness drug. Thank goodness that worked!! The distance from Melbourne to Adelaide is about 1000 km and it took us 3 days. At our first stop we saw wild parrots and koalas. Next stop was the tree top walk at Otway. The walk is 600 meters in length and 25 meters above the ground made from steel. We then made our way to the Lady Bay Resort were we spend the night. We were taken to the light and sound show were we watched the Lochhart ship sink back in 1876. We left the Lady Bay Resort early in the morning and headed toward Adelaide. We toured 3 winery’s before we made our way to the Chardonnay Lodge. The Lodge is built in the middle of the vineyards and is about 4 hours from Adelaide. Across the street is the Poplars vineyard where we bought the best olive oil, garlic and merlot. The next day we headed to the fossil and cave park. That is the first time i have been in a cave and what a cool experience. Well i better run, tomorrow we are heading out to Kangaroo Island at 615am. No sleeping in for me. Well it has been a great 2 days. On Wednesday we went to Philip Island to see the penguin parade. On route we stopped at a small farm house to have tea. We saw 2 Wumbats, and many Kangaroos . I was able to pet my first Kangaroo and feed them out of my hand. Next we stopped at the Koala Conservation center were we saw many Koalas in the gum trees. Next to the beach for the penguin parade. It was very cold, windy and rainy. I had to buy 2 scarves to keep warm. The little penguins came in at about 545pm and we watched them waddle up to their burrows. Not sure how many we saw but the day before there were 720 penguins that came in. What an amazing experience!!!! On Thursday we took the tram to the Victoria Market. At the market we had a tour where we sampled all kinds of food. I sampled peppered roo (kangaroo). It was really tender and i actually liked it. Some of the vendors in the market have been there for 50 years. Next on to the Aquarium where we saw all kinds of sea creatures. Then we made a quick stop at the casino were i donated a few dollars. Ha Ha!! Today we are leaving for Adelaide. We are traveling the Great Ocean Road. It is suppose to be really amazing. Looking forward to that except it is suppose to be quite curvy. I have my gravol so i should be okay. Well i better run and eat breakfast. After an eventful and very enjoyable 2 days in Bordeaux, we are on the move again with a day at sea. It’s also a pretty full day as some of our group need help changing transfers and wanting miscellaneous information. The day is overcast, windy and cold and the Captain has cancelled the Gala lunch on the pool deck. But hey, we are hardy Canucks and so after lunch, decide to brave the cold and went for a dip in the hot tub. Cold outside but toasty in the water…the only problem was the spray we would get off the pool as it sloshed around. We were the only 2 crazy people on deck and it felt like we had our own private area. Good day to get caught up with my emails and some reading. Unfortunately, my Blackberry is still not working and I know there are some emails that I have been waiting for. Will need to have a serious talk with SaskTel when I get home. Managed to get a lot of my work completed though and that means I can relax for the next couple of days. We head out to the Compass rose restaurant again tonight. The menu is always varied and the quality excellent so we never have to worry that we will go hungry 🙂 The dining room has anytime dining so we can go for dinner whenever we want. We usually ask for a shared table so we have been dining with mostly different people each night and it has been great meeting people from across the US, the UK, Australia and a couple from South Africa. Our usual dining time is about 2.5 hours and is a highlight every day as we like to live to eat and not eat to live. The entertainment was a bit of a let down after the exciting show last night. A female singer who wasn’t at all bad but not what we were hoping for as this is the last show of the cruise. It did at least put me in the mood for sleep. Our last day of the cruise since I don’t count the day of disembarkation. Because of the tides, we are not docking in Honfleur, France but instead at LeHavre. 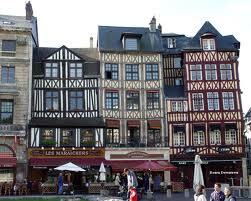 Tours have not changed and we are off to Historical Rouen for the afternoon. Very picturesque village with an obligatory beautiful medieval church that takes your breath away but what is unique about this village is the half timbered houses in the village. Although severely damaged during WW2, they have done a very nice job on rebuilding and restoring the town. Well worth the 1.5 hour drive there and back. As I mentioned, no show tonight although they did arrange for the 2 main singers of the main show to sing some songs with the full band in the Horizon lounge. We have gotten to know some of the singers and dancers on board over the last 14 days and so it is nice to go listen to them again. Also nice to say goodbye to some of the people we have met on board and to some of our group. Disembarkation day is never my favourite day. Not so much that we have to get off the ship but because they want you off as early as possible which we understand because they need to ready the ship for the next group. But really, being out of the stateroom by 08:00? Off the ship by 09:30 when we have a 15:15 flight from London? It is a long bus ride from Southhampton to London Heathrow airport – about 1.5 hours and not inexpensive. The ship’s transfers were $139USD each. But, as luck would have it, neither of us could sleep in and we easily met the deadlines. Three hours at Heathrow are a bit of a drag but we have used Aeroplan points and are flying Business class which allows access to their lounge…a much better alternative to sitting on a hard chair for that long. The Air Canada business class seating was excellent with their lay flat pods. We actually slept for a few hours. The meals and service were very good. Our connecting time in Ottawa was just over an hour but given the size of the airport, that was no problem. I must say, connecting through Ottawa was so much nicer than having to go through the much larger, much busier Toronto hub. That’s it for my Regent Seven Seas Cruise blog. We can highly recommend them for the discerning traveller and if you have any questions or would like more information, please contact us. Well i made it after 36 hours of waiting in airports and flying. Air New Zealand is amazing, i think the best airline i have been on. The service was outstanding and all the fights on time. I did not sleep much on the plane maybe 3 hours at the most. Melbourne reminds me of Toronto with all the hotels, skyscrapers, and shops. Melbourne is definately the city for those you like to shop, drink coffee and go to shows at night. The weather today is cold and rainy. The temp is about 12 degrees. The day that we arrived we walked to the Eureka Sky Deck, which is the tallest building in Melbourne 300 meters high. I did the Edge experience, some chickened out but i did it holding on the rail and not looking down. The edge is a glass dome that goes out on the side of the building at the very top. We seem to be eating and drinking a lot. The food is amazing. We are definitely not starving. We are walking a lot so hopefully burning some calories. Day 2 we did wine tours all day. We toured 4 different wineries and probably sampled 30 different kinds of wine. Of course it is winter here so the vineyards are harvested already but still a great experience. We ended our day at the winery that makes Champagne!!!! I saw my first Kangaroo with 2 little ones in the wild on the drive back to Melbourne. That was really exciting. Day 3 we walked to Federation Square for our Hidden Lanes and Arcades walking tour. We saw parts of the city that the locals don’t even find. Well i better get ready for my dinner tonight. We are having dinner on the Tram Car Restaurant and maybe after if we have time we will go to a show.